My children and I are huge fans of the popular children’s book author, Jane Yolen. I am not as familiar with books written for the tween age group but since I had the opportunity to read the newest title by Jane Yolen I was excited to read it. I am so very glad that I did because The Hostage Prince-The Seelie Wars, Book 1 (list price $16.99 for the trade paperback) of the trilogy series is a fantasy that will appeal to a broad audience. My eight year old son and I decided to read this book together every evening before bed and he absolutely loved it. I even noticed my younger children listening in to the story too as it was so engaging, funny and entertaining. This is a tween fantasy series that introduces the reader to an interesting group of main characters. Snail, a midwife’s apprentice and Aspen, a young prince who has been kept a hostage in the kingdom since he was a child are on a quest for freedom as the threat of war looms over their kingdom. Snail and Aspen have lived very different lives but will develop a friendship that will help guide them as they set out to flee the UnSeelie kingdom and creative positive changes in their world. In this magical land of trolls, underlings and kings, queens and nobility all of these lives will become intertwined and are at a precipice…………..
My son was at the edge of his seat during the reading of this story and I often saw his flashlight on in his bed for up to thirty minutes after his bedtime. When I would check on him he would smile sheepishly, hold up The Hostage Prince and tell me that he “had to read the next chapter”. Not to worry, he was happy to fill me in the next morning on what I had missed out on during his late night reading. 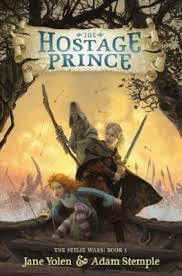 If you have an adventure loving child who loves fantasy then I highly recommend adding The Hostage Prince-The Seelie Wars (Book 1) to their summer reading list! Sorry – that last post came out strangely! This sounds like a book that my 8 yr-old voracious readers would enjoy reading with their dad at night! This looks like a great book for tweens. Good VS evil, and a fun fanstasy. This book sounds like both my neice and my nephew would enjoy it alot! Thanks for the info! I love reading to my grand children – I think I might buy this for them and we can read it during the summer months at the beach … they love to hear stories before going to bed. Sounds like a book the kids would enjoy reading full of fantasy. Thank you for the review or I wouldn’t have heard of the book. shall mention this one to the granddaughter she loves to read and nana might need to read it as well .